It’s a sad fact that Somali music culture is very poorly documented. Even when it comes to field recordings, Somalia is highly overlooked. 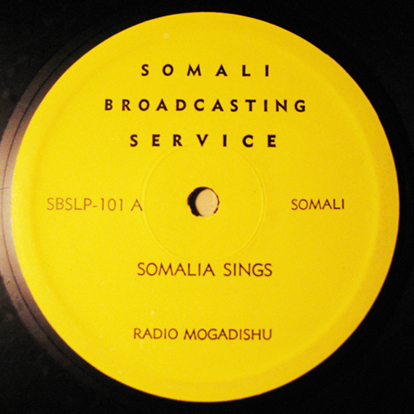 This album is one of the very few 45s and albums produced in Somalia. Modern Somalia was essentially created out of the protectorate, British Somaliland and a colony, Italian Somaliland when the two territories united in 1960. General Siad Barre, a man who wasn’t shy of having portraits painted of himself next to Lenin and Karl Marx, came to power in 1969 after the assassination of the sitting President Abdirashid Ali Shermarke. General Barre went on to establish the Somali Revolutionary Socialist Party where the hope was to bring a blend of Islam and Marxism to Somalia. In reality, Barre transformed Somalia into a military dictatorship. In 1991, a coalition of different groups lost patience with Barres totalitarian rule and forced him into exile. He died in Nigeria in 1995. His remains are buried in the Gedo part of Somalia. CPJ, Committee to Protect Journalists named Somalia as “Africa’s deadliest country for journalists.” However, brave souls keep Radio Mogadishu and other independent alternatives alive. At least Radio Mogadishu’s website is up and running – whether they are actually on-air is unknown at this point. You can read about the first one album in the series HERE. If you have more information on these or other Somali recordings then please leave a comment. Here’s to a peaceful Somalia. Enjoy! Since this posting, I have been contacted by Andreas, who was contacted by a person by the name of Sanaag. He provided the name of the band, as well as the song titles. The first track, Guulwade Siyaad (Victorious Siyaad), was exemplary of Siyaad Barre’s self-glorification and personality cult. Schoolchildren had to sing it every morning and it was often parodied to ridicule Barre and his minions. The second song, Dadkaaga Dhinac Ka Raac (Follow Your Peers / Keep Up With the Pace), carries a positive message. It calls upon all Somalis to pursue relentlessly the goal of developing the country and to work hand-in-hand for the benefit of the whole society.